I am writing this to you on my patio overlooking the gorgeous Caribbean sea. There is a gentle breeze blowing. Birds are serenading me as I type. And the warm salty air feels so good to breathe, I wish I could package it and send it to you! I moved to Puerto Rico only two weeks ago, and it is already starting to feel like home. It hasn’t been all rainbows and unicorns. There have definitely been challenges. But w you know how to ride contrast to clarity, then lemons turn to mojitos and life feels intoxicating and magical! I have SO many manifestations to share. Expect a lot of videos and new courses coming your way soon! 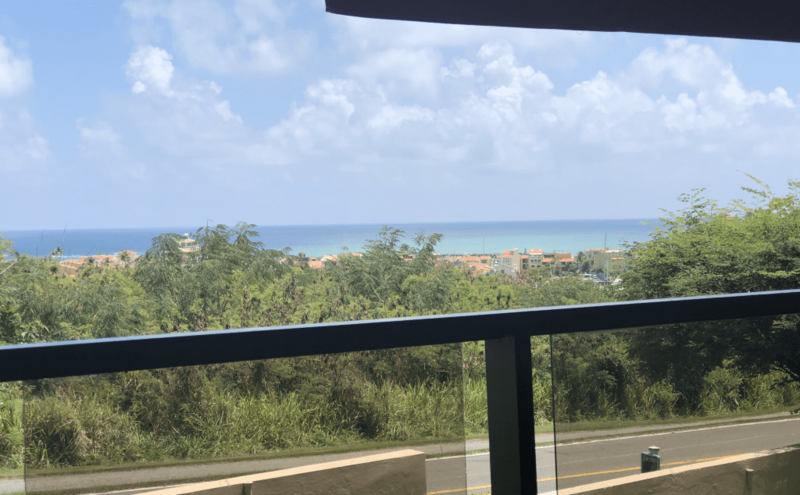 For now, I just wanted to take you inside the beautiful Puerto Rico home that I manifested in just 3 days! Watch this video for a tour of my island pad in Palmas Del Mar. You have to see my view and yet another epic shower! After you watch this video, let me know what you think in the comments below. What kind of a home do you dream of living in? What’s blocking you from making it a reality? I hope this video inspires you to dream bigger and invest in the mindset that will help you achieve your visions! P.S. If you are ready to work through limiting beliefs and finally move in to a home that is so-amazing-it-feels-unreal, then you’ve got to check out my Dream Home Masterclass. Hundreds of people have done this training and have manifested their ideal living spaces in record time… and in miraculous ways! I can’t wait to celebrate your dream home with you!!!! >>> Click here to learn more about the Dream Home Masterclass! LOVE LOVE LOVE! Especially that fantastic view! Can’t wait for my dream home to manifest, I’ll send a picture when it does! This view is everything to me! Can’t wait to celebrate with you as you show videos and photos of your dream home with us Jenne!!!! You blow me away, Lana!!! Your island home is absolutely epic!!! I love it!!!! Will definitely be catching your dream home masterclass again to refresh my skills!!!!! Woo hoo Mel! I can’t wait to celebrate the next dream home coming your way soon after the Masterclass!!!!! I want to manifest a Texas hunting ranch in the hill country so I can go hog hunting or deer hunting in the fall. Awesome! I know the Dream Home Masterclass will help you manifest your amazing Texas ranch! You cannot win if you don’t play! 😉 I will do everything in my power to help you play in a way that feels safe and supported… so you can manifest a life that feels incredibly inspiring and fulfilling to you! How amazing Elizabeth! We are heading to Rincon for a few weeks/months after Palmas. We love it there as well. It’s gonna be tough to decide where we live and where we vacation on this gorgeous island! Lana!!!! This house is amazing, I am so happy for you, I am celebrating with you as I visualize my self in an amazing house in front of the ocean with so much light and beauty. A house where I open my eyes in the morning and the first thing I see and hear is my huge vortex of manifestation and it feels spacious and luxurious and amazing!!! I love celebrating with you because I know I am creating this reality for myself, how Powerful I am!!! I see you there Natalia! And you know that celebrations attract manifestations! So bring it ON!!!! You know it! Can’t wait to celebrate your dream home with you Adrian!! !